The Cisco UCS C240 M4 rack server is the 2-socket, 2-rack-unit (2RU) rack server. It offers outstanding performance and expandability for a wide range of storage and I/O-intensive infrastructure workloads, from big data to collaboration. The enterprise-class Cisco UCS C240 M4 server extends the capabilities of the Cisco Unified Computing System (Cisco UCS) portfolio in a 2RU form factor with the addition of the Intel Xeon processor, which delivers a superb combination of performance, flexibility, and efficiency. 24 slots for registered DIMMs (RDIMMs) or load-reduced DIMMs (LRDIMMs) that deliver significant improvement in application performance: the Cisco UCS C220 M4 server supports 3 DIMMs per channel at 1866-MHz speeds with LRDIMMs. The Intel Xeon processor is designed to deliver the best combination of performance, built-in capabilities, and cost-effectiveness. Flexibility, increased performance, and compatibility with industry standards; substantially increased bandwidth compared to the previous generation, with more flexibility and backward compatibility with PCIe 2.0; greater I/O performance and flexibility. The Cisco UCS C220 M4, the mLOM slot can be used to install a Cisco VIC or third-party NIC without consuming a PCIe slot, providing greater I/O expandability. Low-latency, lossless, 40-Gbps Ethernet and industry-standard FCoE and native fiber channel fabric; wire-once deployment model: changing I/O configurations no longer requires installing adapters and recabling racks and switches; fewer interface cards, cables, and upstream network ports to purchase, power, configure, and maintain. Cisco Data Center Virtual Machine Fabric Extender (VM-FEX) and adapter-FEX technologies, I/O virtualization, and Intel Xeon processor features, extending the network directly to virtual machines; consistent and scalable operational model; increased security and efficiency with reduced complexity; capability to move virtual machine security features and policies from rack to rack or rack to blades. It can be deployed as a standalone server or in a UCS-managed environment. When combined with Cisco UCS, the entire solution can be managed as a single entity with Cisco UCS Manager, improving operational efficiency and flexibility; service profiles and templates that implement role- and policy-based management, enabling more effective use of skilled server, network, and storage administrators. Automated provisioning and increased business agility, allow data center managers to provision applications in minutes rather than days by associating a service profile with an added or repurposed Cisco UCS C220 M4 server. It has capability to move service profiles from rack server to another rack server, blade to rack server, or rack to blade server in minutes instead of hours or days. 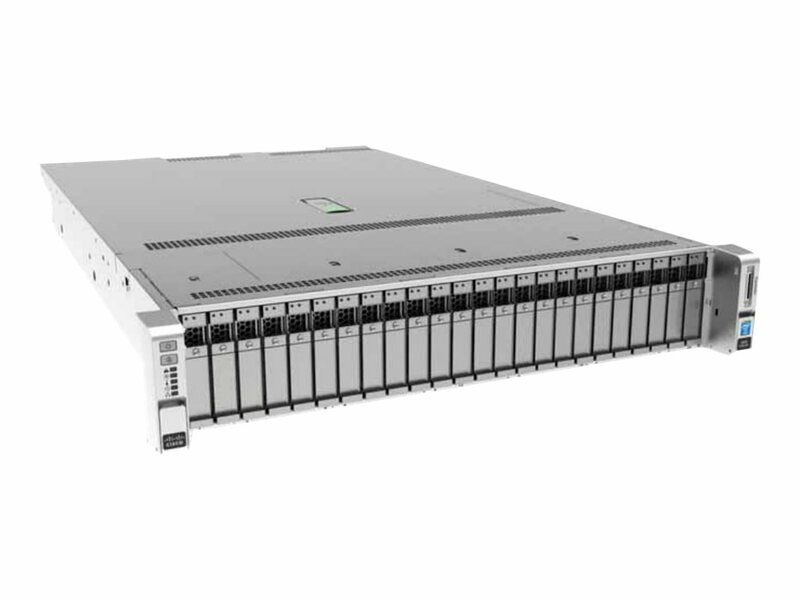 Cisco 12Gbps modular RAID PCIe Gen 3.0 controller provides enterprise-class data protection. RAID card is plugged into a dedicated PCIe slot, leaving the two remaining PCIe slots available for other I/O expansion cards. Web user-interface for server management; remote keyboard, video, and mouse (KVM); virtual media; and administration; virtual media support for remote CD and DVD drives as if local; Intelligent Platform Management Interface (IPMI) 2.0 support for out-of-band management through third-party enterprise management systems; command-line interface (CLI) for server management; provides UCS visibility and control to management ecosystem partners using a comprehensive XML API. Dual-redundant fans and hot-swappable, redundant power supplies for enterprise-class reliability and uptime; convenient latching lid for easy access to internal server; tool-free CPU insertion allows for processor upgrades and replacements with reduced risk of damage; tool-free access to all serviceable items, and color-coded indicators to guide users to hot-pluggable and serviceable items. Trusted Platform Module (TPM) is a chip (microcontroller) that can securely store artifacts used to authenticate the platform (server). These artifacts can include passwords, certificates, or encryption keys. TPM 1.2 SPI-based module is supported. Locking bezel option can be mounted to the front of the chassis to protect against unauthorized access to the drives.